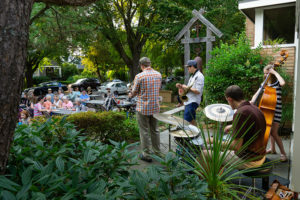 Roosevelt Jazz groups are available to perform for both private and public functions in our community. Whether you need a small combo or the entire big band, we can meet your needs. Proceeds are used by the Roosevelt Jazz Boosters Club to support the Roosevelt Jazz program. For more information, please read below and then contact our Gig Coordinator for a discussion of your needs. Send an email with your contact information and requirements to: hiretheband@rooseveltjazz.org. Our small combos can play anything from early big band standards and show tunes (such as Take the “A” Train and Someday My Prince Will Come) to bop standards and modern jazz songs. We can even put together special requests, as long as we have access to the music. Our entire jazz big band can also play at your event. This versatile ensemble can perform anything from the classics of the Woody Herman, Count Basie, Duke Ellington and Stan Kenton era, to compositions from contemporary composers. Past performances have ranged from providing background music for intimate gatherings to playing before crowds of 20,000 at international jazz festivals. A basic 3 or 4 person combo (piano or guitar, drums, bass, horn or vocalist) is $400. You can add more musicians at $100 per musician. The cost for hiring the entire Roosevelt Jazz Band of 18 to 20 musicians (typically piano, bass, drums, guitar, saxophones, trombones, and trumpets) is $1800. Generally these fees include two sets of music, about 45 minutes each, with a 30 minute set-up window and a 15 minute break between sets. There are additional costs for increased time spent at the event and for travel outside Seattle. Special rates can be negotiated for public service and fundraising events. We will send an invoice via email, which you may pay by check or credit card. The emailed invoice has a link that easily allows you to make online payment by credit card. Checks are made out to Roosevelt Jazz Boosters. We ask that invoices be paid no later than 2 weeks following the event. A 3 or 4 person combo needs an area of about 10 x 10 feet to perform. The full big band requires a larger area, at least 24 x 15 feet. Performers need access to electrical outlets. The groups travel with extension cords and power strips but we want to be sure that your lights stay on and that none of your guests trip on cords! The band brings its own instruments and sound equipment, including amplifiers for bass, keyboard and guitar. Please let us know if you have an on-site piano which you’d like us to use instead of our keyboard. The same space and electrical requirements apply. The drums, piano and bass cannot sit directly on grass unless it is completely dry and the ground is hard. Otherwise some of the instruments will sink into the ground. Plywood or some sort of flooring should be put down. The bass cannot be played in direct sunlight. If night falls while the group is performing, some lighting will be necessary for them to read their charts. Since there is a lot of equipment to move and set up, the closer the musicians can be to the stage when they are unloading, the easier and quicker it will be. They can then move their cars to wherever you want them to park during your event. It helps to know in advance whether there is a parking lot close by and what the fees are to park there. If possible we ask that students receive vouchers to cover parking fees. Musicians need the name and phone number of someone who will be on site during the time the band is scheduled to arrive and set-up. For more detailed information, please contact us by sending an email to: hiretheband@rooseveltjazz.org. Because the musicians have many obligations, including full high school schedules, we suggest making your request as far in advance as possible, at least one month prior to your event. Thank you for your interest in Roosevelt Jazz!